2010, Starring Matthew Amyotte, Nigel Bennett, Stephen Chambers, Mary-Colin Chisholm. Directed by Evan Kelly (Last Call Productions). 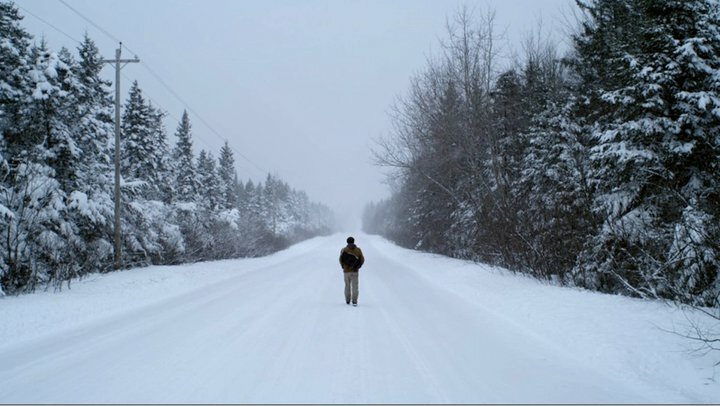 Just in case you needed any more evidence that a breakout genre film scene was gathering steam in Nova Scotia, Evan Kelly's new Stephen King-inspired horror tale The Corridor is set to drop you in a bleak Canadian winter setting to let you fend for yourself. Although this entry notably diverges from the other East coast B-movie hit of 2011, Hobo with a Shotgun, it’s similarly accomplished. A bit of gore and an unnerving sound mix wring some additional scares out of the story of a weird energy field out in the Canadian wilderness, but the emphasis is on psychological horror that manages to disturb via its human interactions. 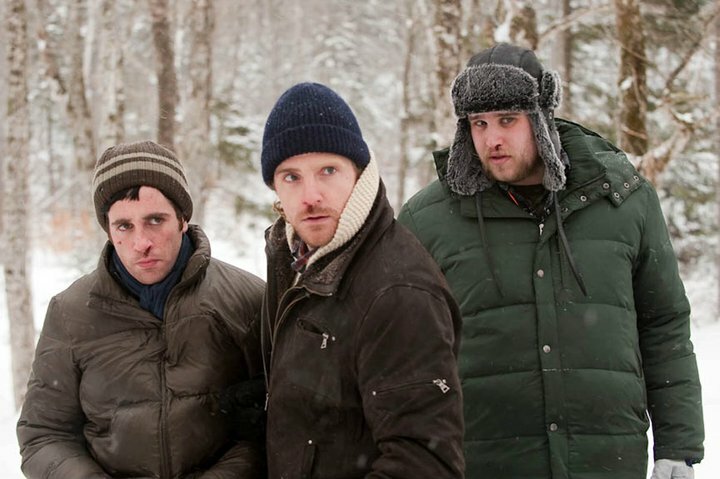 To help their troubled friend Tyler (Stephen Chambers) recover from a psychotic episode and subsequent hospitalization, close pals Huggs (Glen Matthews), Chris (David Patrick Flemming), Everett (Jim Gilbert) and Bobcat (Matthew Amyotte) head off to spend a guy's winter weekend away at a cabin. They hope to help Tyler get over the trauma of killing his mother, but also to reconnect with each other. This keenly observed ensemble piece takes a turn for the strange when the five men are wandering around the woods and stumble on some sort of energy field. Stepping inside, they discover the area is eerily quiet, resistant to the harsh winter weather, and renders all their electronic devices useless. Even more curious is that it keeps doubling in size, creating a very long "corridor" of energy. But only later do they realize that the corridor has triggered a strange psychological effect—as old rivalries rise to the surface, the friends’ innermost thoughts are linked in a way that causes them to start literally tearing into each other in a fit of insanity. Working within a stifling atmosphere of paranoia, director Evan Kelly and writer Josh MacDonald do a lot with very little--the bloodletting and CGI is sparse but appropriate, putting the focus firmly on the disintegrating relations between the men. If Goin' Down the Road was about the failure of two Cape Breton males to make it in Toronto, The Corridor contains a similarly interesting look at the group dynamic as the reunion quickly opens up lingering wounds—Tyler struggles to cope with the death of his mother, while Jim laments his inability to have children while nursing a grudge against former bully Bobcat, who is fixated on reliving old glories on the football field. The characters may appear a little cliché, more symbol than authentic person, but—as with that infamous shotgun-totin' hobo—their dialogue and actions reveal an unanticipated depth. Some good acting and chemistry among the leads helps too. 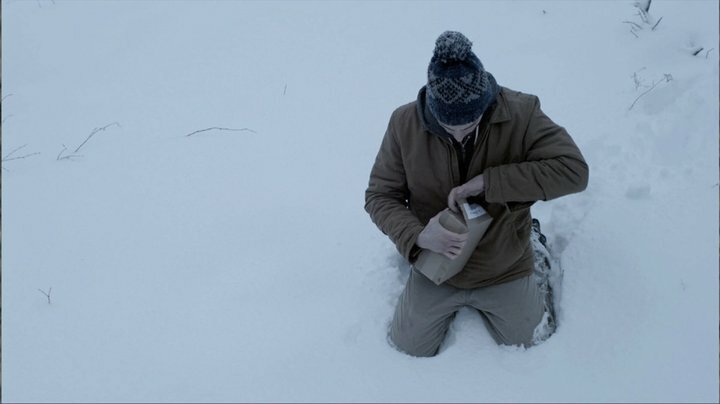 The Canadian winter setting also plays an important role in the proceedings, subtly cranking up the claustrophobia that increases throughout the film. The group really does seem isolated from civilization and the barren snow-covered forest is barren and hopeless rather than inviting. It’s a film that, in the grand tradition of Canadian horror like Rituals and Ghostkeeper, makes full use of its wild, untamed setting to instill dread in the audience. 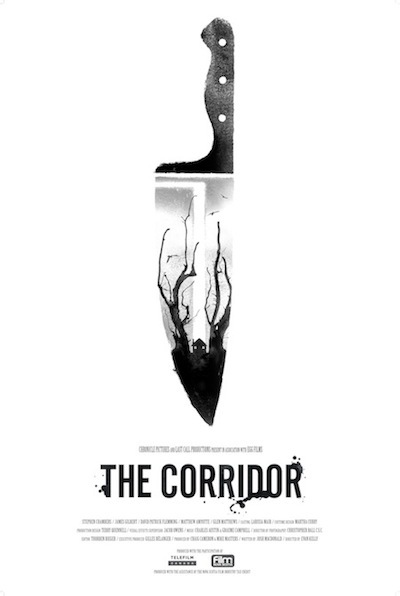 Crackling with an interesting story, solid performances and a measured but gripping pace, The Corridor may not satisfy viewers who crave the exploitation goods—there are almost no women at all in this film, for example—but it’s controlled excursion into terror makes it one of the smartest and most unnerving Canadian horror films in recent years.